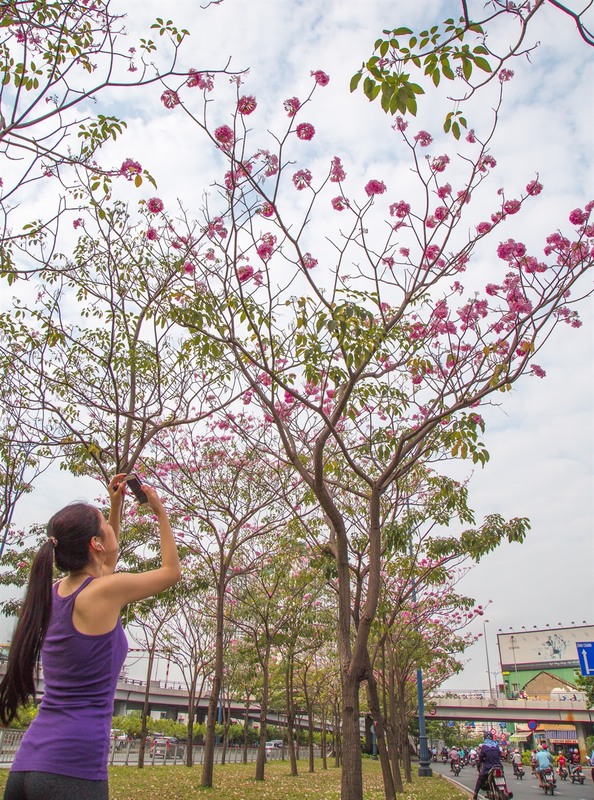 HCM CITY — Rosy trumpet trees along many streets in HCM City’s downtown area have bloomed early this year, beautifying streets with their bright pink flowers. The section of Điện Biên Phủ Street from the HCM City University of Technology to the Điện Biên Phủ Bridge in Bình Thạnh District has the largest number of rosy trumpet trees in the city. Võ Thị Sáu Street from Lê Văn Tám Park to Dân Chủ Roundabout in District 3, Võ Văn Kiệt Boulevard at the Thủ Thiêm Tunnel in District 1, and Nguyễn Văn Trỗi Street’s Công Lý Bridge in Phú Nhuận District also are full of rosy trumpet flowers. The streets are attracting local residents and visitors. The trees have been planted in the city since 2009.